Saturday 27th June was a bright sunny and steamy day in Stroud. Here is an opportunity to view the CCT film of the event. 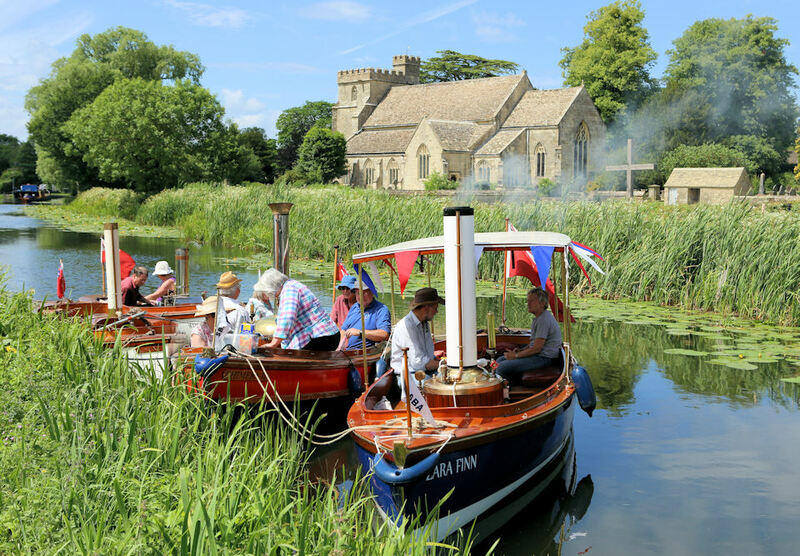 Six fine steam boats cruised the Stroudwater Navigation from the slipway at Strachans Close to Stonehouse. The group moored up for a while to enjoy a picnic in a picturesque setting with St Cyrs Church as a backdrop. Rev Mark Ruddall Chairman of the SBA explained why the day was so special for him. "I grew up with the Stroudwater as a derelict but fascinating feature of Stroud life. To be able to steam on it in my own boat was wonderful and a very real privilege. I salute those working so hard to achieve amazing things with this ongoing restoration and can’t wait to visit again." The event was recorded by Cotswold Canals Trust film maker Robert Paget and photographer Mike Gallagher. Those present on the day will recall the 'waft of coal smoke, steam and hot oil'.